Renewable Energy and #Women4Climate - What's the Connection? 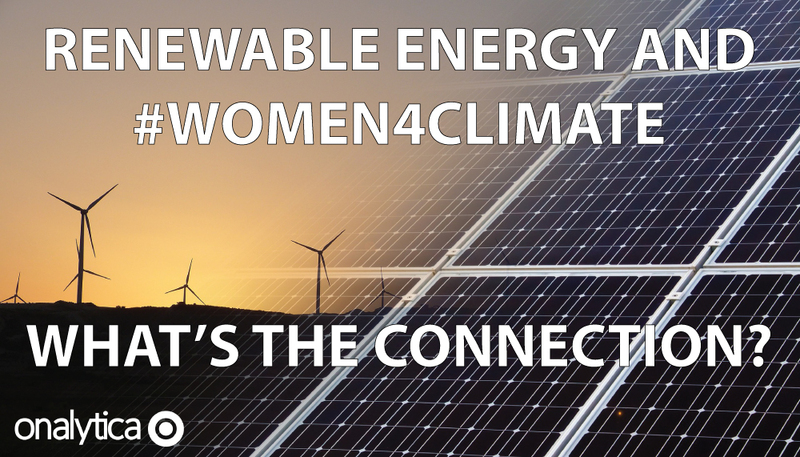 Renewable Energy & #Women4Climate – What’s the Connection? 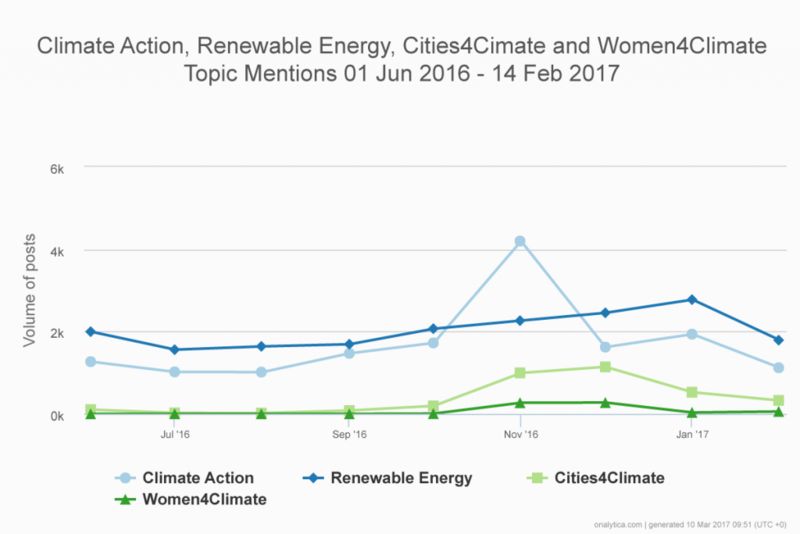 During Womens’ History Month, and in the days before the first ever #women4climate event (convened by @C40Cities), we took a look at the influencers in the broader climate action and energy conversations. Especially given the new U.S. administration’s views on climate change, where and how we find continued momentum to move forward with climate action will be critical. Whose voices are being raised and engaged with in Twitter conversations currently? What are THEY talking about? And, how can we connect the dots to tell better, more accessible stories that keep bi-partisan audiences on the cleaner energy path? The spike in discussion around Climate Action in November was due to the #Cop22 conference. The steady growth of the renewable energy debate occurred leading up to and around that date, from July 2016 – January 2017. 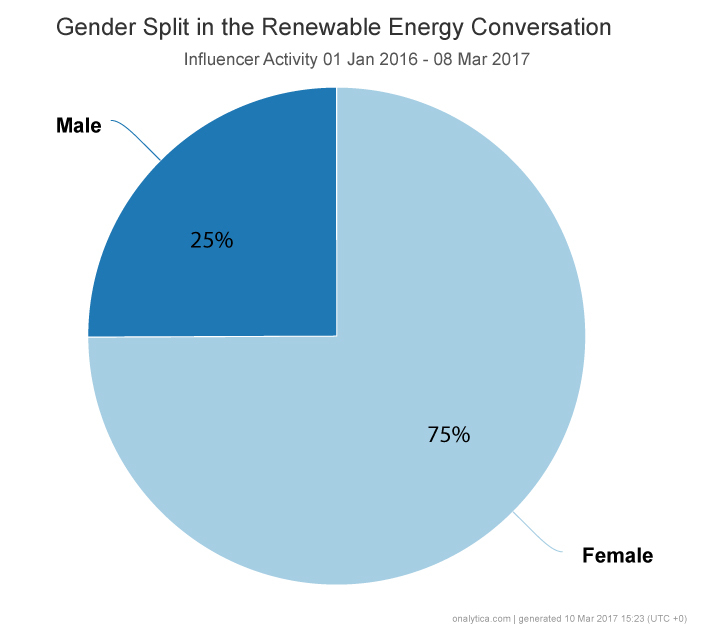 Leading up to the #Women4Climate event in New York City, March 15, it’s certainly interesting to note the influence of women – more than men – in Twitter’s renewable energy conversation among the top 300 climate influencers (see the pie graph below). It might just be that leading women influencers have identified renewable energy as the most mainstream-accessible topic in climate action. Let’s keep our eyes on how the #women4climate voices, in particular, impact the momentum of the global renewable energy transition moving forward. Andrea Learned is a climate action-focused writer and strategic communications consultant helping business and nonprofit influencers develop authentic, high impact, leadership platforms. Her expertise in women’s leadership momentum comes from her early career work in marketing to women (she co-authored Don’t Think Pink, which published in 2004 ). Andrea shares her insight on the potential for women, especially in climate action leadership, through her contributions to the HuffingtonPost , her own blog, and many other publications. WHO ARE THE TOP INFLUENCERS AND BRANDS? Stay tuned, as we will delve deeper into why this seems to align with #women4climate, and more of the fascinating data, in our follow up post after the March 15, @C40Cities event in NYC (link to that event page).